The 2017 Child Well Being Survey (CWBS) asked parents and guardians in Greater Cincinnati and Northern Kentucky to rate their child’s dental health and asked how many times their child had seen a dentist for preventive care in the past 12 months. Seven in 10 parents in the region reported that their child’s teeth were excellent or very good (71%). Parents in suburban Ohio counties (77%) were most likely to rate their child’s teeth as excellent or very good. Dental health varied by a parent’s rating of the child’s general health. Better physical health was linked to better dental health. Nearly 8 in 10 parents who rated their child’s general health as excellent or very good also rated their child’s dental health as excellent or very good (78%). Among parents who rated their child’s general health as good, 4 in 10 rated their child’s dental health as excellent or very good (43%). Fewer than 2 in 10 parents who rated their child’s general health as fair or poor rated their child’s dental health as excellent or very good (19%). Responses varied by income. Only 5 in 10 parents in households earning 100% or less of the Federal Poverty Guidelines (FPG)1 rated their child’s dental health as excellent or very good (49%). That compares with 7 in 10 parents in households earning between 100% and 200% FPG (69%) and more than 7 in 10 parents in households earning more than 200% FPG (75%). In our region, more than 1 in 10 parents or guardians reported that their child had not received any preventive dental care in the past 12 months (15%). 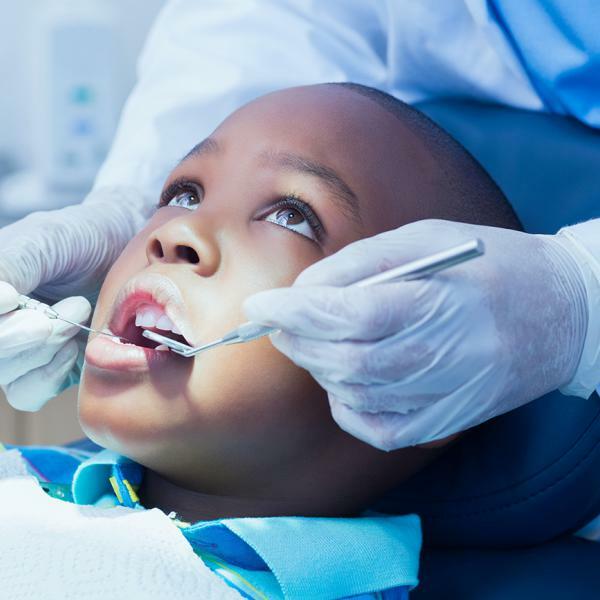 Children in lower-income households were more likely to go without dental care. Two in 10 children in households earning 100% FPG or less (22%) or between 100% and 200% FPG (18%) had not received any preventive dental care in the past 12 months. This compares with 1 in 10 children in households earning more than 200% FPG (10%). According to the Centers for Disease Control and Prevention, tooth decay is one of the most common chronic diseases among children in the United States, and rates as one of the top unmet health needs in children.3 The condition of a child’s teeth influences a child’s general health and well-being. These questions help us better understand the dental health of our region’s children and can inform discussions about improving dental care in our region. 1 In 2016, 100% FPG was $24,250 for a family of four and 200% FPG was $48,500 for a family of four. 2 Data Resource Center for Child and Adolescent Health. (2016). National Survey of Children’s Health– Child and Family Health Measures – Health Care Access and Quality – Preventive dental care, 1-17 years . Retrieved from http://www.childhealthdata.org/browse/survey. 3 Centers for Disease Control and Prevention. (2014). Children’s Oral Health. Retrieved from https://www.cdc.gov/oralhealth/children_adults/child.htm.